As soon as we arrived in Massachusetts last September, I was investigating the nearby parks to find out what wildlife opportunities might exist. I quickly discovered that Plum Island (which contains the Parker River NWR and Sandy Point State Reservation on it) is a terrific place for birds on the Massachusetts coast. Even better news was that it often harbors a wintering population of snowy owls, and it's considered one of the best places in the lower US to find them. I think these birds are stunning, and I immediately added a snowy owl to my mental wish list for this winter. After seeing reports of owls in the area on ebird.org I took a trip there in December, but came back empty handed. On my first outing of 2012 though, I was able to photograph this gorgeous juvenile along the dunes of Sandy Point State Reservation (and in this image, sitting on the ice that formed in the tidal areas). I was there for sunset, but the skies were cloudier than I expected, so I was shooting mostly in fading overcast light -- all the more reason to make a return trip under blue skies as well! View more images of owls in my Birds of Prey Gallery. You hit a home run here Pat. I would love to photograph a snowy owl. Absolutely beautiful! Wonderful photo! Thanks! That is stunning. Even if you go back, I don't know how you can top that photo but no doubt you will. Great shot Pat. Stunning work as always. stunning image, very jealous! Thinking I need to add this place to my list! Exceptional capture! 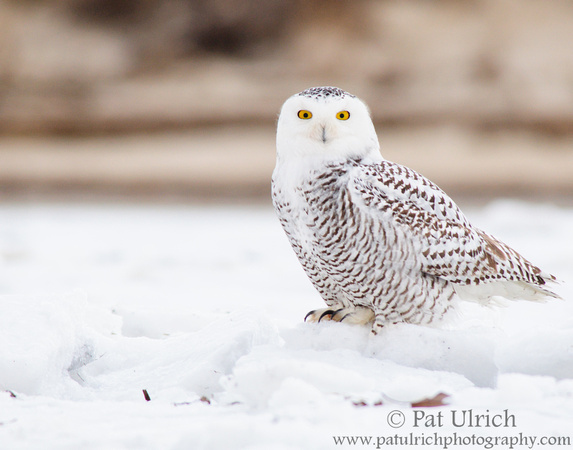 We have a few Snowy Owls visiting the Chicago lakefront this winter. What a treat! I have ventured out to see the owls and was fortunate to view one. We had to keep our distance but oh what a sight! Oh, wow! Stunning shot! I'd love to see one someday. Fantastic shot Pat! I keep hoping the eruption will head south here to CA but it doesn't look like it. Wow! I can see why you like that one. Stunning bird. Not one I expect to see in the next day or two! Beautiful! I'm haven't been able yet to photograph a snowie. Hopefully it will still happen this winter!